Exciting news! 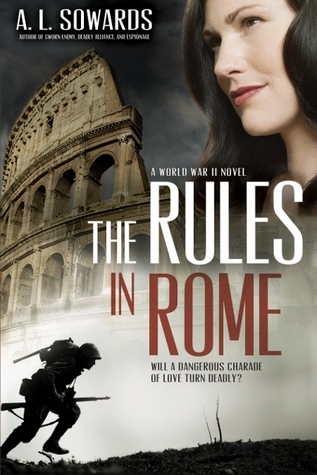 My writing friend, Amanda Sowards, has released a new book, The Rules in Rome. Amanda is a WWII historical fiction writer. I’ve read her other three books and loved them, so was super excited to be a part of her blog tour today! I hope you will sit back and enjoy learning more about her newest work. With Hitler’s forces firmly entrenched in Europe, countless heroes seek to end the madman’s reign. Bastien Ley is one of the best. Working in Italy for the Office of Strategic Services, he’s been tasked with sabotaging German convoys. When his team kills an officer headed for Rome, the man’s similarity to Bastien is undeniable, and seeing an opportunity to turn the tide of the war, Bastien makes a bold decision: he will assume the dead officer’s identity. He becomes Dietrich, an Iron Cross–wearing German officer—an ideal position from which to infiltrate the Nazi ranks in Rome. To help with his stressful assignment, his superiors send him a reinforcement in the form of the lovely Gracie Begni, an intelligent and eager radio operator with absolutely no undercover experience. With a gulf of resentment between them, these two agents must find a way to portray a couple in love. Soon their reluctant alliance becomes much more as Bastien and Gracie find themselves getting lost in their feelings for each other. But as they engage in battle against the deadliest foe the world has ever known, the pair quickly realizes their love may be doomed. As the Rome Gestapo threatens to destroy all they’ve worked for, will Bastien and Gracie survive their charade? IT IS! I devoured it. This WWII fiction thriller is set in Italy. The main characters are Bastien, an Allied spy posing as a Nazi officer, and Gracie, a female radio operator fresh out of OSS training. Sowards always does a great job researching the time period and intrigues of war in the place her stories are set. I was transported into war-torn Rome and felt hungry and desperate as I turned the pages and watched this spy story play out. The action and suspense never stops and will keep you on the edge of your seat (unless you’re reading in bed). The characters are real and wrap themselves around your heart. I cheered for them; I bit my nails off for them; I cried a few tears too as things got a bit rough. Bastien’s and Gracie’s relationship is complicated and fragile, as they must work together to get time-sensitive information to the Allies while posing as a couple when others are around to see them. Hearts aren’t a good thing to wear on your sleeve during war, and it’s downright dangerous for spies to consider when each day could be their last. If you like storytelling that weaves history, romance and action together, then I highly recommend this book. Sowards is a master of her craft. Enter a Rafflecopter giveaway for your chance to win $25 and a copy of the book. That’s always fun. And follow the book along its blog tour (like a groupie–you know you want to). Hope you have a fantastic week. Stay tuned for an update on my book tour (the Tour de Hands). Tomorrow we’re heading to the midwest, where snow-covered prairies reign. You might need snow shoes. I don’t know if my poor nails will ever have a chance. I can’t stop reading, and the nails are my ‘go to’ when I’m stressed…and tense plots stress me out! Yeah, I know. But my mind doesn’t listen to me. Thank you so much for your review, Char! You’re welcome! Good luck with your release! You deserve it. This sounds great – I love historical fiction and Rome so it’s a perfect combination – thanks for letting us know about it! I’ll make sure to look it up. It was super fascinating history how the radio operators met contacts and sent out their reports to the Allies. Very scary work. How in the world are you reading all of these books, one after the other, so many in such a short amount of time? Are they made out of chocolate or something???? I’ll admit, I’m a super fast reader if I like the book. I’m one of the slowest if it isn’t the best writing because I’ll keep putting it down or switching to another book to read. But if the book was written poorly and covered in chocolate, I still might inhale. My thighs are grateful books aren’t made out of chocolate.